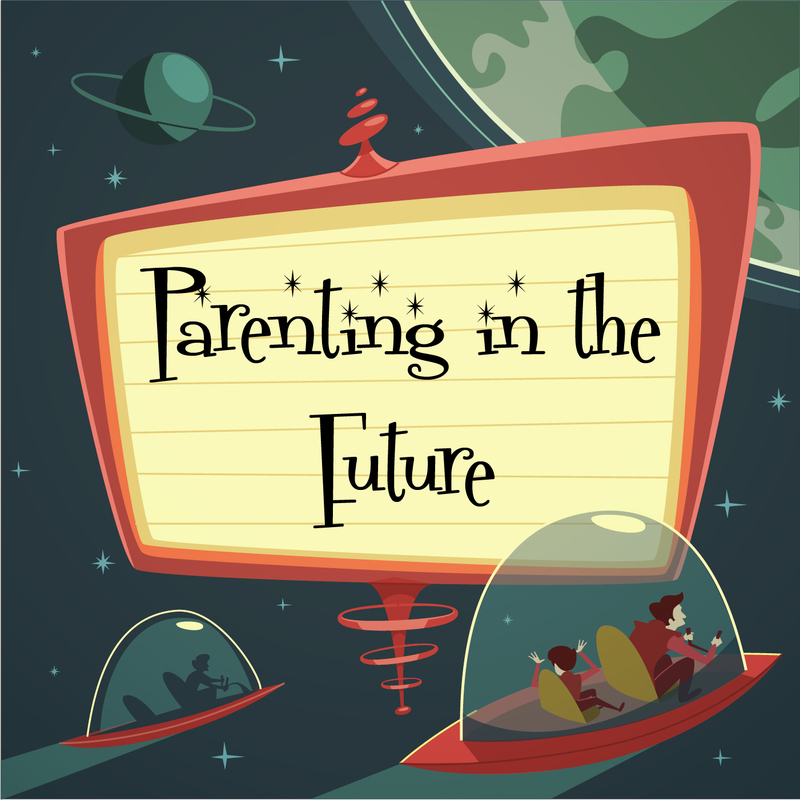 Kim and Chris talk about their experiences of bullying in response to the CDCs new definition of bullying; healthy relationships and using empathy as a way to get along; and they introduce themselves and talk about the goals of their new podcast. Did you see the article called A Natural Fix for ADHD by Richard Friedman in the NY Times on Halloween? I saw it because my child’s curriculum assistance teacher sent me an email saying “It soooo makes me think of Fiona…especially when they mention the nomadic people. 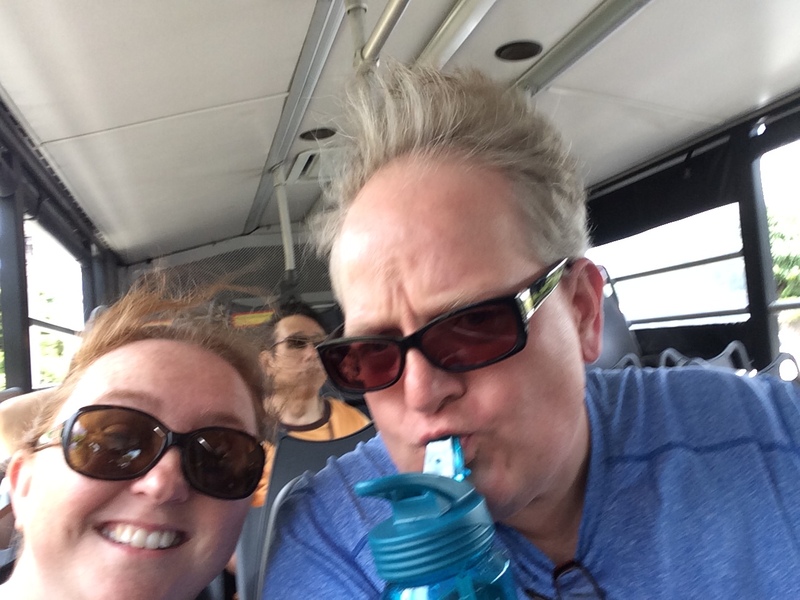 We are just talking about her traveling the world.” This post could go on to tell you how much I love Fiona’s curriculum assistance teacher. The fact that she is reading and thinking about my daughter at 11 pm is so telling to me, and I see why Fiona has success at school in great part due to her teacher. Instead, however, I’m focusing on the content of the article and how it soooo makes sense! And it gives me hope for a very bright future for my daughter with ADHD and anxiety. I thought this was a great read and helps me see how my daughter is going to be able to create success for herself in adulthood. In fact, I can totally see how my kiddo will benefit from ADHD once she gets to choose her own environment. That is the take away I got from this article-ADHD is really hard for kids because they have to go to an institution that quite frankly is boring for their brain and body. At least that is true for Fiona. School and the mundaneness of life are quite boring to her. There are exceptions. She loves project based learning where she can incorporate her love of technology, such as the math project where she gets to put pictures of her beloved Anime characters on a poster. The other aha I took from this article was a better understanding of Fiona’s total all-consuming desperate attempt to always be online. The section on technology makes so much sense as she is truly caught between two worlds; one with immediate gratification and intense imagery and stimulation (digital world) and one that is, well, not that. No wonder this kid complains daily about going to school. It is painful for her. She doesn’t fit in; she feels as if she doesn’t belong. 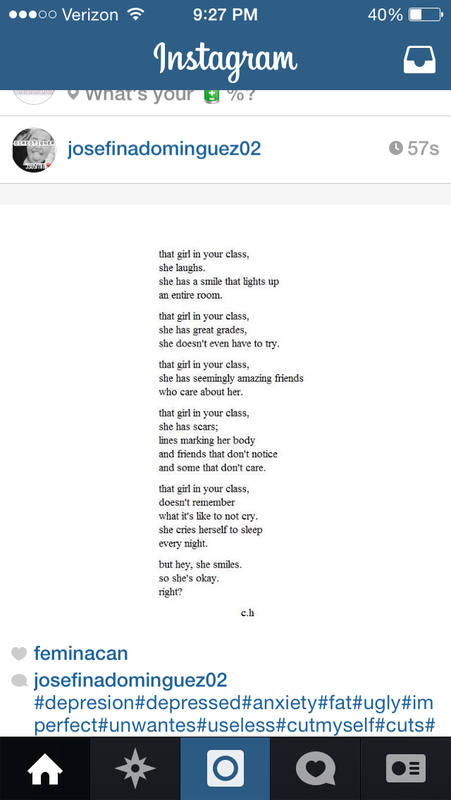 A poem on Fiona’s Instagram account. One of many. 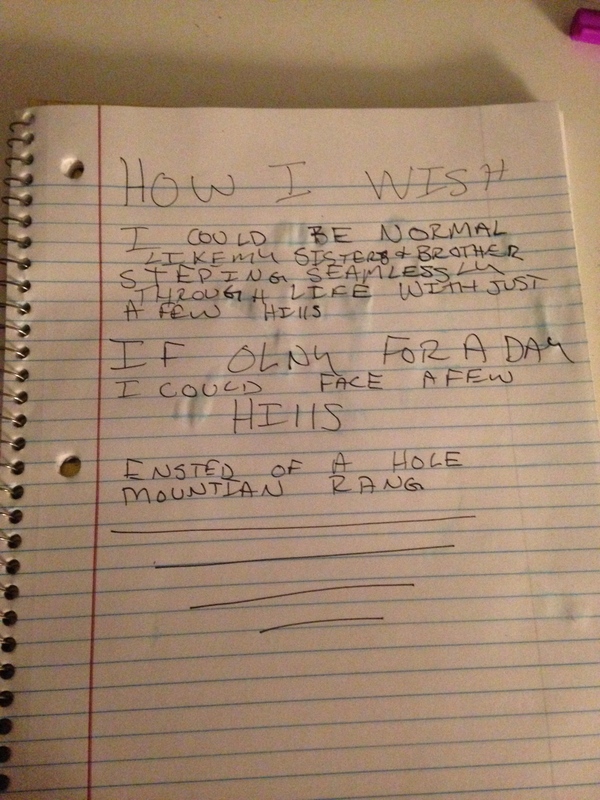 A poem Fiona wrote during a sleepless night. One of many. I tell Fiona so often that it truly does get better. The older she gets, the more choices she has. Just this week she got to select her options for alternative high schools. She wants to learn welding at the career technical school. Doesn’t really fit with my ideas of how I would plan her life, but I love that she so clearly understands herself, and understands that she would be so much more successful in a school where she gets to use fire and hot metal to create art at school. And truthfully, that sounds so much better to me than having sitting in a math class, even one that let’s her print out anime pictures. She’s not made for sitting and listening. That’s what I love most about her, and what I want so most for her is to find an environment where her talents and natural abilities can shine, where she can be engaged, and .